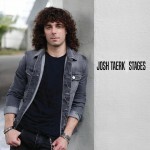 Share the post "EP review: JOSH TAERK – Stages"
Josh Taerk has long been a favourite here at Ritchie towers and he is now back with a new five song EP, although one song ‘After The Fall’ is lifted from his last album ‘Here’s To Change’. For his young years Josh has a knack for penning lyrics that are though provoking and inspiring at the same time. ‘Learning To Let Go’ is a prime example, carried along by a melodic refrain and Josh’s easy on the ear vocals. The only thing we can control is learning to let go, the song nails it on the head and again the guitar creates a perfect foil for Josh’s impassioned vocal. ’Jekyll Or Hyde’ is a chance to highlight his singing – loving the vocals on this and the guitar solo. ‘Neverland’ would sit nicely on a love songs compilation, not that it is cheesy, more that is the best way sometimes to get that next break out in popularity. On your new EP ‘Stages’ you have again produced some very heartfelt lyrics backed by a catchy melody. Where do your song ideas come from? Are they always based on personal experiences and do you find your song writing grows stronger the more experiences you have lived through? Thank you. Whenever I think of songs that mean something to me, they are songs where the writer put a piece of themselves into the story they were telling. That made those songs relatable and that experience, those feelings more real to me. The most important thing for me as a writer is being able to write songs that people can connect with and relate to their own experiences, thoughts and feelings. Music is about connecting with people, sharing stories, and I can’t expect people to connect with my songs if I’m not putting my heart and soul into the stories I’m telling. ‘Jekyll & Hyde’ has one of your best singing performances to date. How do you keep your voice in such good shape? Someone said to me once, “you get praised in public for what you practice in private” and I’ve really taken that to heart. My voice is a muscle and in order to build strength and endurance I train my voice by doing vocal exercises regularly and keep it healthy by eating right as much as possible, especially when I’m not on the road trying to find food after a gig. I’ve had some amazing vocal coaches in my life, Micah Barnes in Toronto and Brett Manning in Nashville. Both these guys continue to push me and give me different exercises to help me grow as a singer. I also have fun with it, and love testing my voice and experimenting with different textures to see what happens when I sing in different registers or in different ways. I find out so much about what my voice is capable of doing just by trying stuff. How do you keep your positive side to your songs, as although they can deal with life changing events, there is always a sense of hope contained in the songs? That’s a huge compliment. I wouldn’t be doing what I do if it wasn’t for hope and faith. There have been many times that I’ve come up against what seems like a concrete wall, people telling me that I won’t succeed and that I should stop trying. Faith in myself, my choices, what I feel is right and the hope of that faith taking me where I want to go is what keeps me reaching for the bigger and brighter. That’s probably where that thread of hope comes through in my music. I write songs based on my story, hope and faith are a big part of that story. You play four UK dates, including two in London. Do you plan more UK and European dates later this year? Have you seen interest grow in your music over here in the UK since your last visit? I have the best fans in the world. Throughout the time I wasn’t here, my fans stayed connected with me and my music on social media. When I announced that I was playing these shows, I got so many RSVPs and messages from them and it was the greatest feeling seeing them at the shows. One of the things I love about social media is that you can be a musician from anywhere and still make that instant and direct connection with people everywhere. I had so many people come up to me at my shows and say, “I saw your videos on YouTube” or “I’ve been listening to your new EP on Spotify and had to come and see you live!” That’s such a great feeling knowing the content you’re putting out there, music or otherwise, is connecting with people. After being back in the UK this past week and playing those amazing shows, you couldn’t keep me away for that long again if you tried. I’m working on more UK shows for the spring/summer as we speak. What’s next after the ‘Stages’ EP? In the current musical climate will you focus on EP’s/single song releases or are you planning a full album release at some point? I’m always writing and I’m looking forward to going back to the studio and really bringing this batch of songs to life. As far as whether it’s going to be a single, an EP or an album, I don’t really know until we get close to being done production. For me, it’s all about how each song and story connect with each other that leads me to releasing them all together or one at a time. You rock, thank you for being on this journey with me. It’s been one hell of a ride so far and I can’t wait to see what happens next! This entry was posted in All Posts, INTERVIEWS, Interviews/Rising Stars Revisited, Single and EP reviews and tagged EP, interview, Josh Taerk, melodic, pop, review, rock, singer songwiter, Stages. Bookmark the permalink.